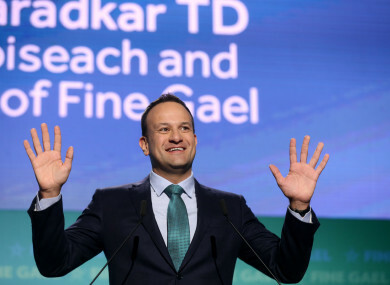 TAOISEACH LEO VARADKAR used his closing speech of the Fine Gael National Conference to state that income taxes must be reduced further. While there was a lot of talk at the Whites Hotel in Wexford this weekend about when a general election will be called, it was no surprise that some election promises would creep into his address. Reiterating the announcement he made at the party’s Ard Fheis last year, Varadkar said over the next five years, Fine Gael will increase the point at which people pay the higher rate of tax to €50,000 for a single person and €100,000 for a couple. “I believe we must reduce income taxes further, and reduce the cost of accessing public services as well,” he said. In addition to making the promise to put more money in the people’s’ pockets, the Taoiseach used his speech to highlight Brexit, housing, and Ireland’s growing economy. Not surprisingly, he also used tonight as an opportunity to take a pop at Sinn Féin and Fianna Fáil, while being sure to thank his independent ministers in government for their comradeship. While the confidence and supply deal has been extended – the Taoiseach did not hold back on the party that is keeping him in power. Look around at the other parties and ask yourself where the alternative is. Fianna Fáil is a party with no ideas, no policies, no alternatives. I’m sorry Micheál, but hurling from the ditch isn’t a policy, conspiracy theories don’t constitute analysis, and finger wagging isn’t a solution. In contrast, Sinn Féin is a party with plenty of ideas and policies. Bad ones. Higher taxes, more borrowing, more debt. But the bigger problem I have is that the values of Sinn Féin are toxic. We see it in the culture of bullying, in the personalised aggression in the Dáil, and on those occasions when the mask slips. At some point between now and 2021, there will be a General Election. And I can tell you tonight that under no circumstances will Fine Gael enter Government with Sinn Féin. Varadkar said Fine Gael policies and “hard work” has “transformed” the country. “Things are far from perfect, but we are in a much better place than we were, and we can be optimistic about the future,” he added. Looking ahead to autumn, he said a referendum to extend voting rights in presidential elections to all Irish citizens no matter where they live will be held. “I know that there are mixed feelings about it and it’s a referendum that won’t be easily won. But I am sure it’s the right thing to do. “There’s no such thing as a second class Irish citizen. I believe an Irish citizen in Belfast, or Sydney or Chicago is every bit as Irish as one in Wexford or Dublin or Galway,” he said. Housing, which Minister Eoghan Murphy acknowledged today will be an issue they are asked about on the doorsteps, said “while it may not always feel like it, we are making progress – lifting thousands of families out of homelessness, helping first-time buyers, capping rent increases and enhancing tenants’ rights”. Taking a more conciliatory tone, he addressed the issue of the skyrocketing costs of the National Children’s hospital. “I know there has been a lot of focus on the rising cost of the new National Children’s Hospital. First of all, I want to say to everyone at home, that we accept responsibility for the mistakes made in projecting the true cost of building this project. We cannot claim the credit for things going well if we do not also accept responsibility when things go wrong. And this is one of those occasions. “I promise you, we will learn the lessons and ensure it does not happen again. But more importantly, now that it’s started, we are going to finish the job,” he said. Email “Taoiseach promises income tax cuts and rules out entering government with Sinn Féin”. Feedback on “Taoiseach promises income tax cuts and rules out entering government with Sinn Féin”.